Brush, knife or string? 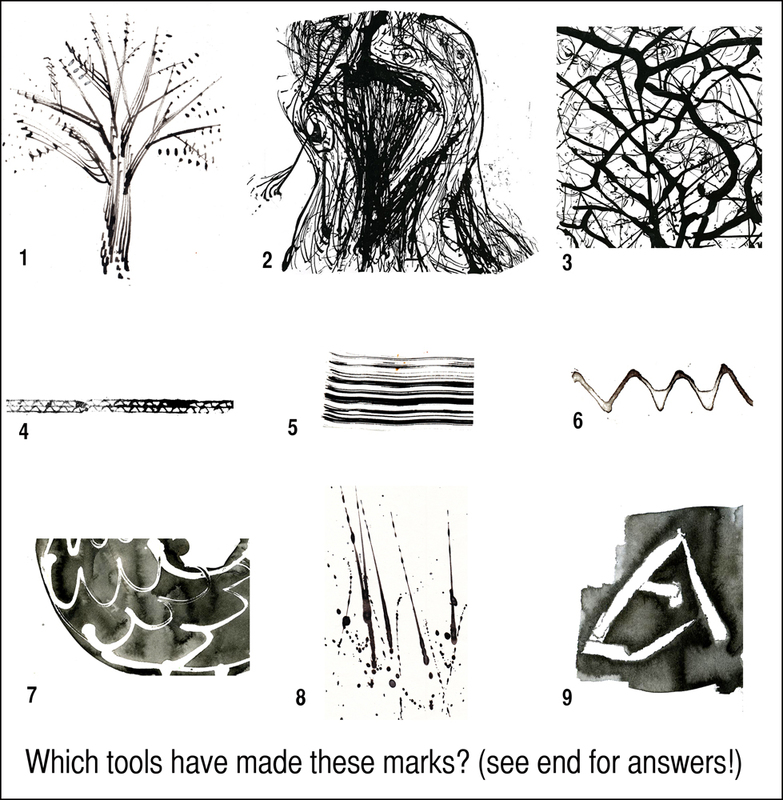 Which tool shall I use to make my mark? The marks you make and choose are like your handwriting, they're unique to you. Much depends on the toolkit you use, as well as your materials. 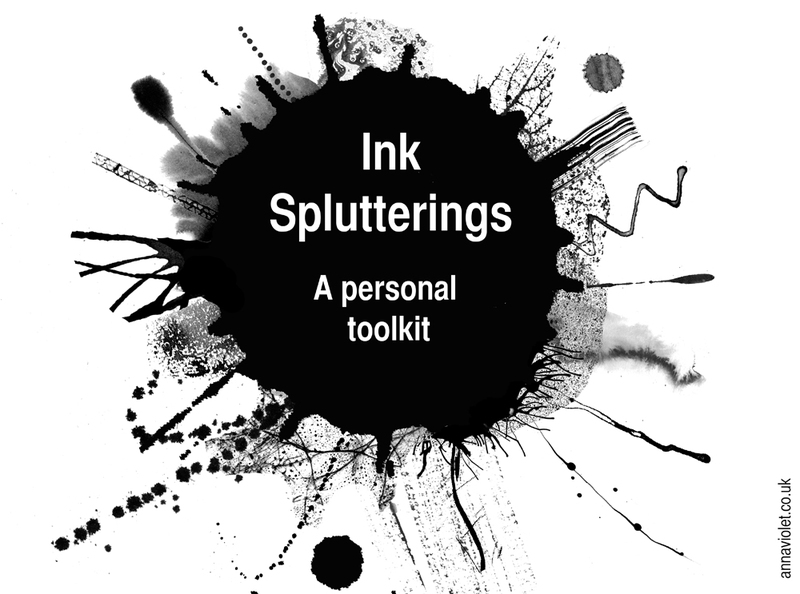 My own personal toolkit has evolved (and is evolving still) in response to my experiments with different tools and inks. Here are some of my findings. Ink seems to have a fluid expressive life of its own. It floods, flows, runs, trail, seeps, creeps, splats, flicks, meanders, mottles, separates, puddles, scratches, mixes, patters, sprays, resists, drips, prints and swirls. Ink is bold, stubborn and wilful: it wants to go its own way. The tools you use can help you capture some of this attitude to your advantage. I like an image to look fresh, handmade and almost effortless, using just the right marks (yes, I'm on a long journey with a very large recycling bin!). So, for me, the best tool is the one that appears to do most of the work for me in the least self-conscious way. I am prepared to mix and match my application methods depending on what I want to show. Different ink marks bring different connotations with them, depending on how they were made. Is the mark deliberate or accidental? Spontaneous or carefully measured? It is often the unintentional marks left on the floor that are the most interesting. What sort of energy do I use when I make them? Do I flick from an old toothbrush, draw with string, blow through a straw or squirt the ink from a height? Do I add more water when it's drying or maybe try out some salt? Wet or dry paper? Candlewax-resist or masking-tape resist? Do I tilt the paper to let the ink concentrate on the lower part or do I let the ink run down the paper in lines? Do I mix and overlay different techniques, too? 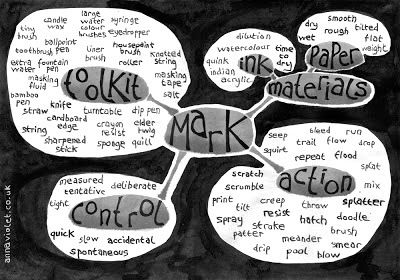 The diagram below is my take on the ink mark-making process. The mark depends on the tool I use, the materials, the sort of control I exert and the action I employ. Oh, and add in my ideas of what the character or scene should look like, too! When I was at college I was encouraged to draw with unusual tools, such as plastic forks, string, straws, cardboard edges and sticks. They felt like impediments at first and I was out of my normal comfort zone but the results could be surprising and inspiring (as well as dreadful!). I took to certain tools and built up my own personal toolkit and way of working. Big watercolour brushes hold lots of water and are great for loose fluid washes that flow, flood, creep, seep and bleed. Housepaint bristle brush produces lovely stripes. I get a swollen puddle edge to an area by drawing onto thick paper with a syringe filled with very dilute ink and waiting 24 hours for it to dry. 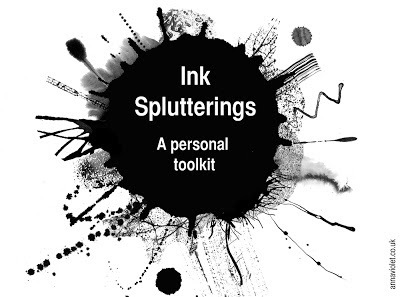 I also use my syringe to squirt out ink in splats onto paper on the floor. The eyedropper on the ink bottle squeezes out great dots, similar to a slip-trailer on ceramics. My elder twig makes a jagged line as I scrape it across paper. Blowing ink through a straw leads to very organic plant-like growths. I get my most surprising marks from a piece of string with a loop and knot at the end. I coax this gently over paper and it keeps flipping over and going another way, leaving trails of mysterious lines. So go on, try out some new tools! And please share any favourite or unusual tools in the comments section below. ANSWERS: Which tools have made these marks? Anna Violet is a freelance author-illustrator based in Manchester. She won the Undiscovered Voices Tribute competition 2010 and was Featured Illustrator 2011. She illustrated a young readers book, How Anansi Got His Stories (Oxford University Press) in 2011. She blogs here. I'm always going to associate you with Jackson Pollock now. Thanks Heather, I do like the energy and rhythm in Pollock's drip paintings. I wonder what his take on children's books characters would have been! Sounds great though anything left to dry in my house for 24 hours would end up with fingerprints from child and possibly nose print from dog unless under armed guard at all times. I like your experiments with string - lots of lovely texture. Thanks Amanda, I'm pleased u like the string marks. I can see i need to add finger pads and noses to the toolkit diagram! This is so exciting. When I grow up I'm going to train to become a children's illustrator. Just train. I can't face the trying to get published that comes afterwards! Yes Candy, the training is great fun! I went to a talk by Jim Kay of A Monster Calls fame. He drew on top of old chopping boards so that the scratchiness came out on the paper. Yes, really menacing and effective with the knife-cut impressions! I may have to start playing as I haven't done anything like this for years. I used to love using masking fluid and inks. Thanks for reminding me it's about fun and experimentation, Anna. Lovely post. Thanks Maureen, I hope u get the chance. I love masking fluid and ink, too - especially that magic moment when you pull the dried fluid off, ready to see the results. Great stuff Anna Violet, you've really made me want to start experimenting. Thanks Paul, I hope u enjoy!